One thing all racers have in common, no matter the type of racing, is the garage. To get a little philosophical here, what is a garage? For me it's a place to escape the world, a place to tinker, a place to embrace our inner Edison. As men, it's in our DNA, we can't help ourselves -- we're wired to try and make things better. Women will never understand this drive, even though they have no doubt benefited from it. In fact, without this drive we'd all be living in caves. Now on to the utility part of this article. Below are a few random thoughts, many coming from the mindset of "If I had it to do all over again." I have built a garage from scratch and I'm currently half way through another. To layout the inside of your garage, consider the method used to design golf courses -- draw the inside shape of your garage on a piece of paper. Next make paper cutouts (to scale) that represent items you want to put in your garage -- benches, etc. Then just move the items around on the paper until you find the best layout. Of course there are computer programs that can do the same. This may seem daunting, but by far the best method is to pull everything out of your garage and then put back one item at a time. I think you'll be surprised by the number of items you don't return to the garage. Racers never think their garage is too big. Need more space? Think vertical. Move items that don't get used often towards the ceiling. I hate having to hunt for things to do a job. So, depending on the task, I build a workstation or put together a kit. A kit is usually nothing more than a toolbox with everything needed. If you're designing a new garage make sure you have plenty of outlets. You should also wire for items you may add in the future, like a welder, air compressor, hoist, etc. I've never seen a garage that had too much lighting. Fluorescent lighting will be best in most cases, but if you want some ambiance, add some recessed lights. I'm not a fan of painted or epoxied floors. I've yet to see one stand the test of time and use. 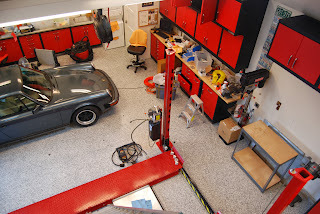 In-floor heating is awesome, but would be hard to justify if you don't use the garage everyday. Overhead gas will probably be best for most. A home furnace can be used, just be careful you don't collect return air near the floor -- many flammable vapors, including gasoline, are heavier than air and sink to the floor. For heating and cooling it's going to be all about where you're located. Unless you're using a home furnace, you're going to be stuck with a window AC unit or a mini-split system. Both of which are better than most people think and especially effective if you have divided areas (which is something to consider). No matter where I was located I'd go overkill on the insulation. The nice thing about a post (pole barn) construction building is it allows for more insulation in the walls. Nice to have, but if you're up north you'll have to worry about freezing pipes if you don't heat all winter. Maybe plumb it so you can drain the system or add rv antifreeze. To me, with waterless hand cleaners I don't need water, but can't imagine a finished garage without plumbed compressed air. The debate over what type of pipe to use never seems to end -- black pipe, copper or pvc. Heavy wall copper tubing has my vote. Seems like a great idea, but in my first garage I probably used it once in ten years. For me the keys are a nice top, the proper height and a very secure attachment to the wall and/or floor. Where I live the mice are tenacious. They will find every single weakness in your structure, high and low. The biggest problem is them chewing through wires (which they love) and starting an electrical fire. Best advice: Great Stuff foam together with bronze wool. Another problem here in the north. I fixed my icing when I stopped listening to roofing and insulation people. Icing has almost nothing to do with insulation. It's all about air flow. If I could offer only one piece of advice it would be to make your garage a comfortable place -- A place you want to be -- a man cave. And maybe, if society is lucky, you'll spend more time in your garage and invent something -- moving the human race forward. If you have some photos of your garage, we'd love to see them.